Evidently there are two different theories on how the delectable dish known as “Eggs Benedict” came to be. This next part below is from National Day Calendar’s website, and I am willing to bet that they know their stuff! In 1894 stock broker Lemuel Benedict ordered “buttered toast, poached eggs, crisp bacon, and a side of Hollandaise” at the Waldorf Hotel. They were so impressed with the dish that they put it on the menu substituting ham and English muffins in place of the bacon and toast. In the early 18th century, Pope Benedict XIII liked an egg dish so much that he requested it time and time again. It is also believed that Pope Benedict XIII had an illness which added to his desire for this particular egg dish, hence the name Eggs Benedict. Whatever way you lean, we can all agree that this dish is pretty much everything a brunch dish should be. Park a bottomless strawberry mimosa…. (wait…peach mimosa…wait…mango mimosa …who are we kidding it’s bottomless mimosas) and we’ve got a hell of a meal before us! Whoops! Got lost there for a second. And now I’m composed again. Eggs Benedict is quite possibly my Top 5 breakfast food. So, what happens when your darling fiancé hates, no…LOATHES it?! I’ll play nice. In honor (and bastardization) of Eggs Benedict Day today (this the sixteenth of April) An homage to both an infamous traitor and the most delicious of breakfast meals, deconstructed, mangled and adapted for even the most persnickety of palates to enjoy. Heat skillet to medium and cook/reheat/prepare the hamburger patty to desired “doneness”. I let the patty sit on a paper towel before I put the cheese on, but some people throw it on while it’s heating in the pan which is AOK too! In my heart of hearts, I truly know how sad this post might make the purists to even put it on that level of “NOM” that is Eggs Benedict, Original “OG”. But you know what…it’s damn good. At the end of the night I will have no regrets (other than the antacid I’m feeling I’ll need now) and know that we ate a delish meal and we still got to celebrate National Eggs Benedict Day, in our way…together…as a family….because nobody refused to eat it. The Great American Benedict, bringing families together since 2018. 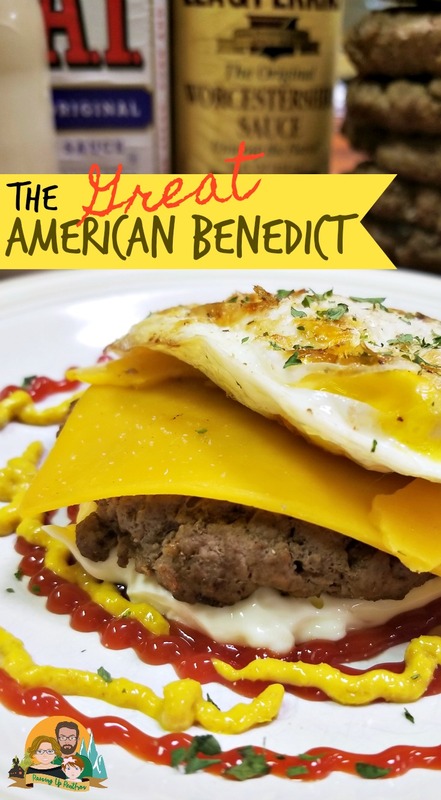 Let me know your American Benedict experiences or any other recipes you and your families have changed beyond recognition in the comments!